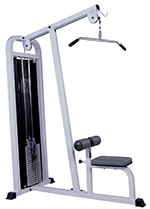 The pulldown machine or the cable lat pulldown is a strength training device designed to develop and strengthen the back muscles. It simulates the mechanics of a pull-up and isolates your upper back while you are anchored in an upright seated position. Start in a seated position with your knees tucked under the pads. Hold the bar at approximately shoulder width with your palms facing into you. Lean back slightly and keep your shoulders pulled back as you pull the bar down towards your chest. Return the bar back to the starting position and repeat.